Patricia Long, Chairperson – Patricia Long graduated from the University of Toronto in 1972 and enjoyed a successful career in Systems Development with Manulife, the Royal Bank and OMERS. Patricia and her husband have raised two children. 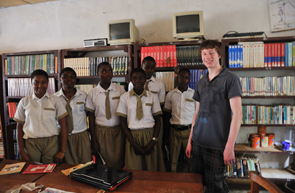 In 2005 Mrs. Long travelled to Kumba, Cameroon in Africa to deliver books and computers to the Samuel and Susanah Eta Learning Centre and Reading Room. She was moved by the work being done by the students and staff there. She has subsequently contributed to the construction and operation of Eta College, Kumba, provided oversight for the administration side of the school and has been a driving force in the establishment of Eta Colleges International charity. John Eta (Founding Member) – John Eta was born in Cameroon, from three houses of chiefs. Very early in his upbringing, he was taught the values of responsibility and looking out for others, especially those less fortunate. He was also taught the value of making a contribution to the community. Mr. Eta then attended a boarding school in Cameroon which emphasized the value of leadership and the spirit of perseverance in leadership. Mr. Eta was a secondary school teacher (sciences and religious knowledge) and housemaster at a private missionary school in West Africa. He came to Canada in 1968 on a University Scholarship and studied at the University of Toronto. He graduated with an Honours B.Sc., a Graduate Certificate in Public Health Administration, and a Masters in Social Work. After graduation, Mr. Eta was a social worker focusing on continuous and social learning. In 1983, he opened his own private counseling practice based on learning models and, in 1984, founded a business education company with his partner, Mrs. Barbara Lord. For more than twenty years, Mr. Eta has been involved in working with intelligent children. His undying passion is to teach these children the values of responsibility, caring, leadership, and contribution, in order to do well and participate in creating a world in which others do well also. His vision for Eta Colleges in Africa is to raise young people who will shoulder the care and responsibility of finding solutions for the endemic problems of Africa, south of the Sahara. Barbara Lord (Founding Member) – Born and raised in Toronto, Ontario, Barbara Lord graduated an Ontario Scholar in English, history, German, French, and Latin. She studied at the University of Toronto, where she received several academic awards and scholarships, amongst them the James A. Priestly Award for Academic Excellence for achieving the highest average in her university year. She graduated in 1975 with a joint B.A. in Economics and Philosophy. Mrs. Lord was an economist at Wood Gundy Ltd., and then accepted a position as a market research analyst at Philips Electonics Ltd., where she chaired the Market Research Committee of an industry association. In 1979, Mrs. Lord opened her own market research company which she ran successfully until 1984 when she and Mr. Eta founded a business education company together. Mrs. Lord then spent the next twelve years acting as a learning specialist within such private corporations as Sunbeam Canada, Fisher Price Canada, and GSW Water Heating Company. Together, Mrs. Lord and Mr. Eta maintained a successful private counselling practice, as well as founding King's college School in September 1994. Since September 1994, Mrs. Lord has been Headmistress of King's College School and teaching subjects in the areas of English, history, economics, law, philosophy, and politics. She worked with the graduating class of 2003 in order to start the first Reading Room in Kumba, Cameroon which was the beginning of what is now Eta College - Kumba: Benesure Campus. In 2005, Mrs. Lord was one of a group who travelled to Kumba with parents and students from King's and has a passion to help create many African schools to raise African leaders to solve Africa's problems. Ambrish Jaiswal - Ambrish graduated from the Punjab University, India in 1982. He completed his CA from India in 1986 and AICPA from Delaware in 2001. Ambrish and his wife Alka have two children. Ambrish has more than 20 years of international experience in business transformations within the banking and insurance industries. He has a strong track record of leading bottom-line efficiencies, driving profit growth, performance and process improvements. In addition to his current role as Chairman at Embrace, Ambrish manages the BeauVest group of companies, a venture capital firm specializing in growth capital. Before joining BeauVest, he worked at senior finance roles at CIBC, the Royal Bank, Benesure and Manulife. He is an avid pet lover and dedicated to various charities. He enjoys racquet sports. He like to travel and learning about the different cultures.